will get humans one mile closer to the red planet! Remember how exciting the Apollo program was? Imagine how revolutionary the first crewed trip to Mars will be. As humans step out onto the surface of another planet for the first time, wouldn’t you like to know that you had a part in making that happen? Now you can! You can enable the exploration of Mars by sponsoring a Mars Mile. 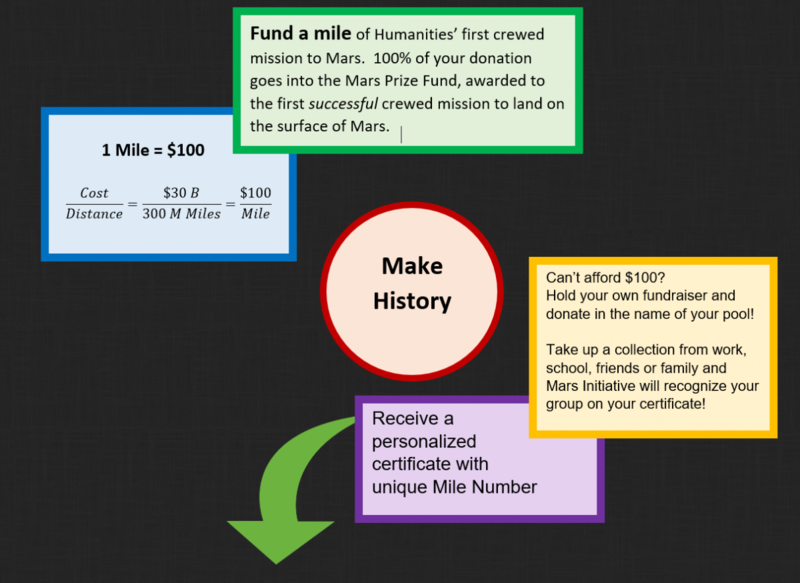 A Mars Mile is earned for every $100 USD you donate. 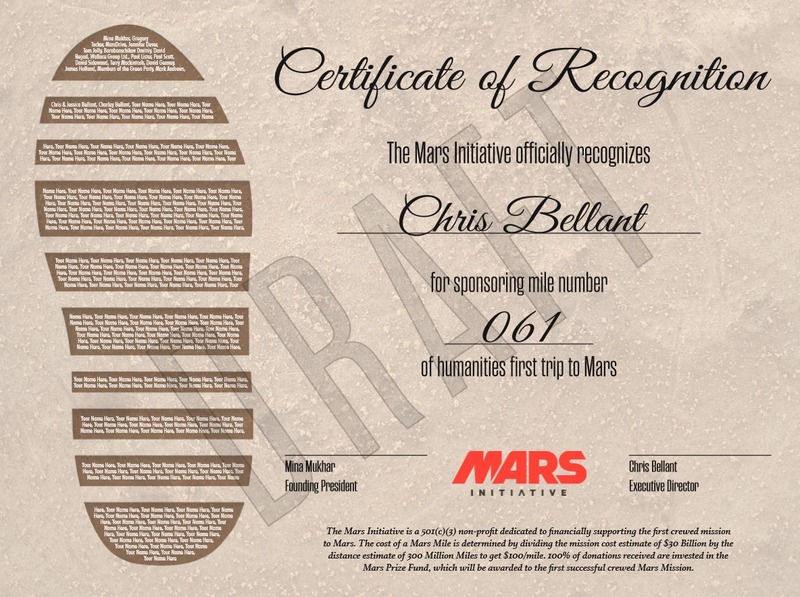 We track our donations closely so no matter how you choose to donate (once a year, monthly, or one time) we send your personalized and uniquely numbered Mars Mile certificate as soon as your contribution reaches $100. Your Mars Mile certificate is your proof that you were directly involved in getting humans to Mars, and you’ll know exactly what part of the trip you paid for! Our Mars Miles certificates make great conversation starters, awesome gifts, and unforgettable memorabilia from what will certainly be an event as amazing as the Apollo launch. To make a one-time single donation to the Mars Prize Fund, click the “Donate” button below. If you would like to sign up for annual or monthly donations, select your desired amount and click the corresponding “subscribe” button below. Either way once your total donations reach $100 you will have sponsored a Mars Mile and we will get your unique certificate of recognition in the main to you. Certificates will be mailed in December of 2017 for the first time then monthly after that.